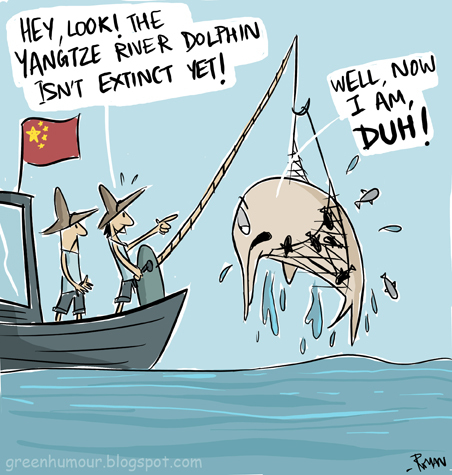 The Yangtze River Dolphin or the 'Baiji' is a critically endangered marine mammal, already declared ‘functionally extinct’ as scientists failed to record any recent evidence of its existence.Entaglement in fishing nets has been one of the main threats to the species. Populations of the Baiji declined drastically as China industrialized, using the Yagtze increasingly for industrialization, transportation and hydro-electricity. The species hd been nick-named the Goddess of the Yangtze but the Chinese failed to treat it like one.